For IPF to be diagnosed, other causes of interstitial lung disease should be excluded. 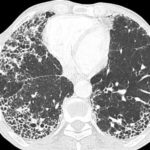 A new clinical practice guidelines summary for clinicians regarding idiopathic pulmonary fibrosis (IPF) has been released that describes clinical manifestations and diagnostic interventions for the disease. The report was published in the American Journal of Respiratory and Critical Care Medicine. According to the guidelines, a useful strategy for evaluating the severity of lung function impairment in monitoring IPF progression is pulmonary function testing. As IPF progresses, single breath diffusing capacity of the lungs for carbon monoxide tends to decrease. The preferred diagnostic strategy for IPF includes volumetric scanning of the chest by high-resolution computed tomography (HRCT). The new guideline contains information on 4 diagnostic categories: Usual Interstitial Pneumonia (UIP) pattern, probable UIP pattern, indeterminate for UIP pattern, and alternative diagnosis. In addition, the new guideline describes 4 distinct histopathologic patterns for IPF on biopsies. For identifying the most appropriate diagnostic intervention, the researchers recommended taking into account 8 different aspects of patient management: medical history, serologic testing for CTDs, cellular analysis of bronchoalveolar lavage fluid, surgical lung biopsy, transbronchial lung biopsy, transbronchial lung cryobiopsy, multidisciplinary discussion, and evaluation of serum biomarkers.